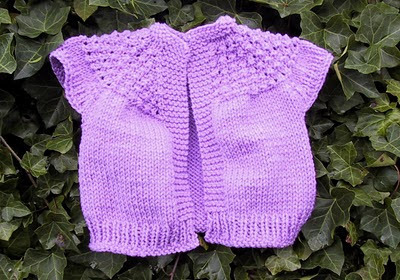 This vest is yet another adaptation of the 5 Hour Baby Sweater originally posted on Knit List. There are several adaptations on Bev’s Country Cottage. Thank you Virginia for testing this pattern. 4/2/10 Edit to row 24, remove knit before K5. 2. I used a 29 inch circular needle and Red Heart Super Saver yarn. M1: Make a backward loop and place on right hand needle. Increase (inc) 1 st in next st: Knit into front and back of that stitch. Starting at the neck edge, cast on 37 stitches, using “knitted on cast-on”. If you don’t want a button knit row 4 across. K1, M1, K6, M1, K7, M1, K6 (23 sts for other front). Garter Stitch Rows 26-33: Knit 8 rows. Ribbed Rows 26-31: Work K1, P1 ribbing. (WS) Bind off in purl. Is this pattern available or adaptable for bigger girls--say size 7 or 8? Sorry, it isn't available for larger sizes.